You’ve been spoonfed a lie for your whole life! 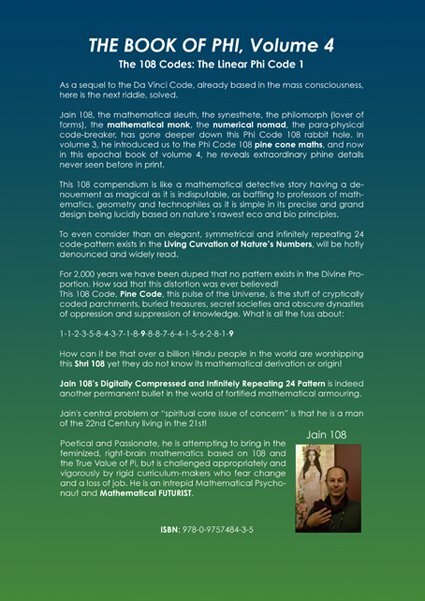 The anointed Pi that you know (the Circle To Square relationship) is a deliberate disharmonic frequency. 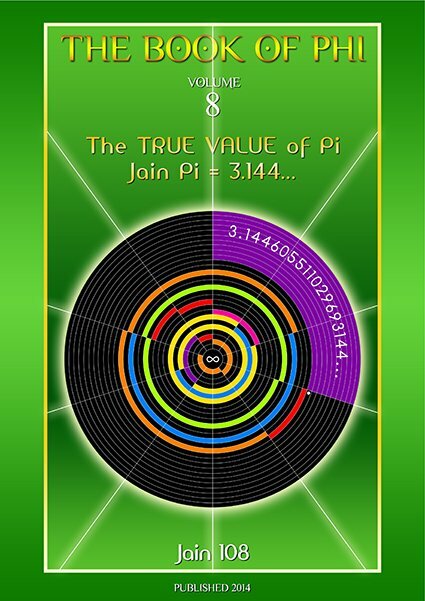 It does not equal 3.141592… Ask NASA, they use another value for pi! 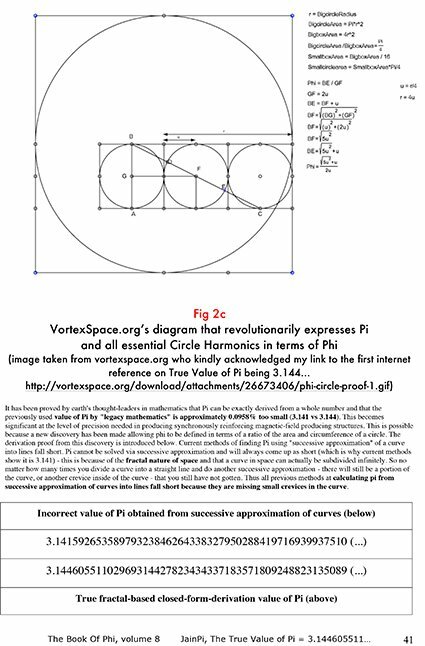 This erroneous pi value is merely an approximation for the limit or sum of millions and billions of triangular polygons (like narrow slices of a pizza) used to derive the circumference of the circle, fudging straight lines to achieve a smooth curve, using the Linear to comprehend or describe the Non-Linear Curve-Circumference. 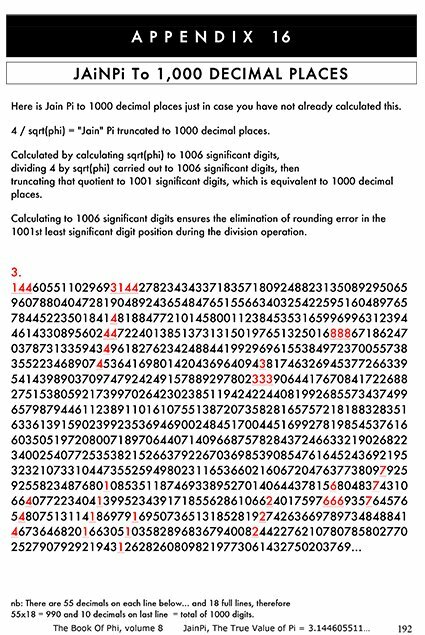 It does not reflect or account for the millions and billions of tiny or infinitesimal little Areas Under The Curve. 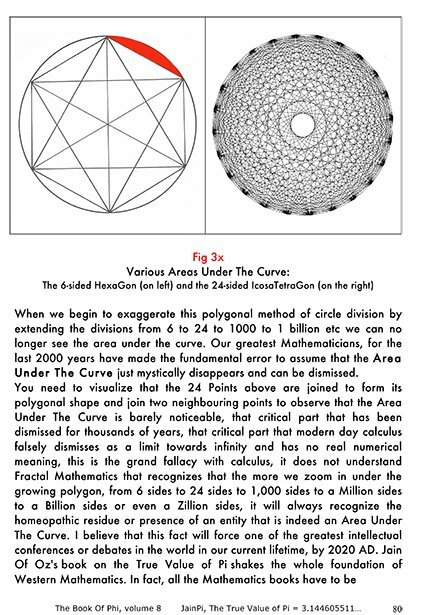 The fundamental error is that our greatest mathematicians for thousands of years assumed, with brute force, that the more polygons we imposed the more magically that the Area Under The Curve would simply just disappear. Like der. An ancient and embarrassing intellectual faux pas. 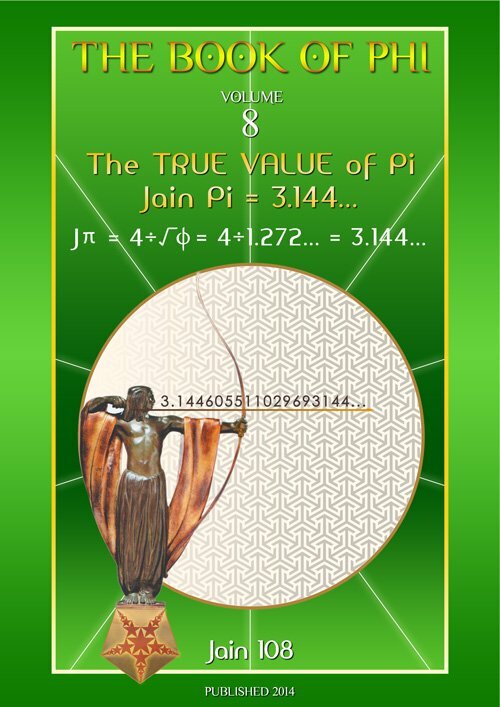 •Fortunately, the True Value of Pi, known as JainPi = 3.144605511029693144… can be determined, by copying and comprehending the Phi-ratioed mathematics of flowers and crystals, the human canon and planetary distances from the sun: based on the Golden Root or Square Root of Phi (1.272… which is the height of the Cheop’s pyramid when its apothem or centre of base to edge length is 1 unit). 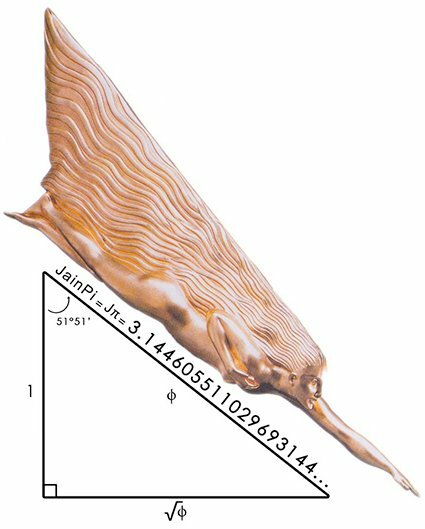 JainPi = 4 / √ϕ (4 ÷ by the square root of Phi). Number of Pages: 247 photocopied pages. 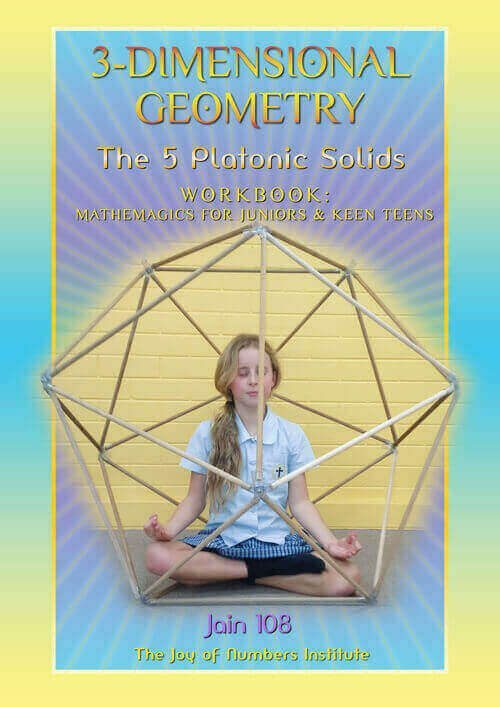 Published: 2014 Self-Published, First Edition. 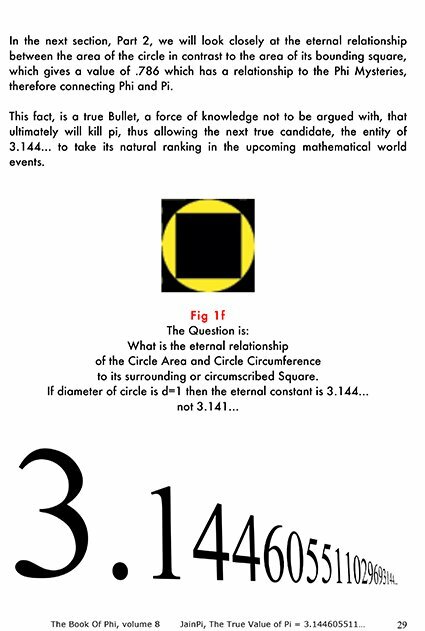 Size: the book is a golden rectangle but fitted or orientated to A4 landscape. 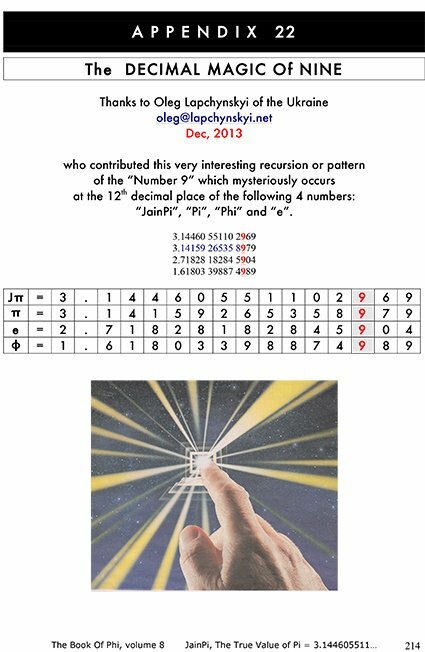 It is highly illustrated, is hand-written in parts but mainly computerized. 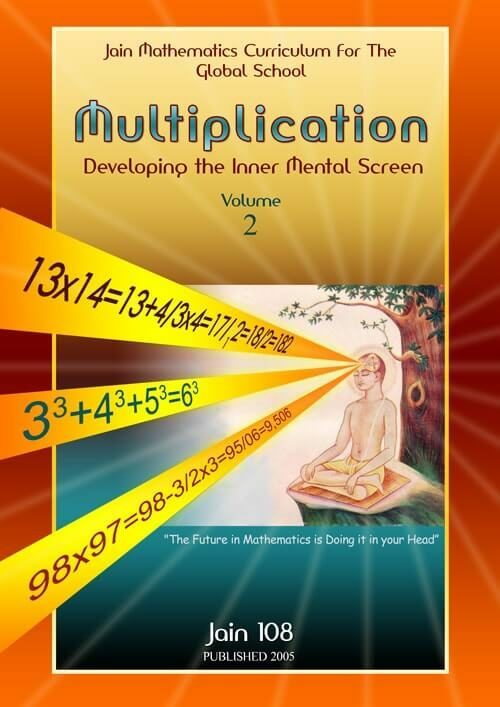 Upon the Face of the Electronic Calculator! 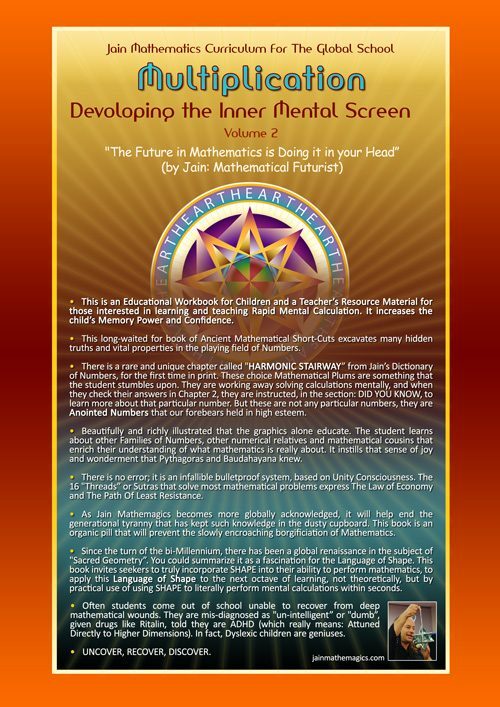 2014 (a promethean year, due to shake the world’s mathematical foundations). 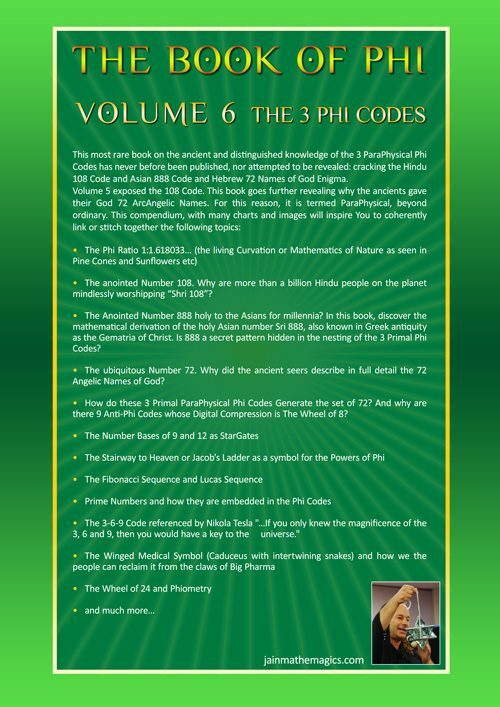 Phi-Pi: Where Else Does Phi and Pi Exist? 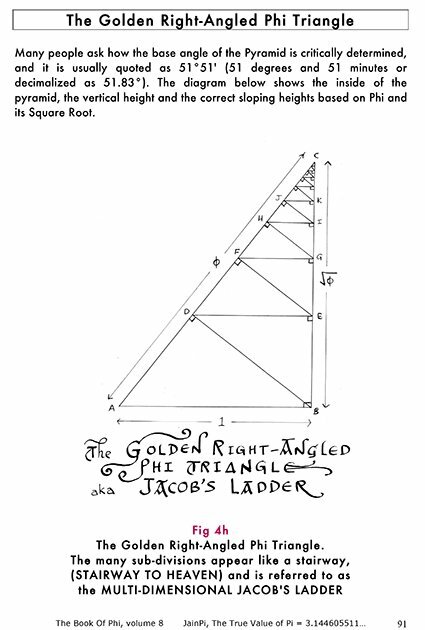 − The Golden Right-Angled Phi TriΔngle. 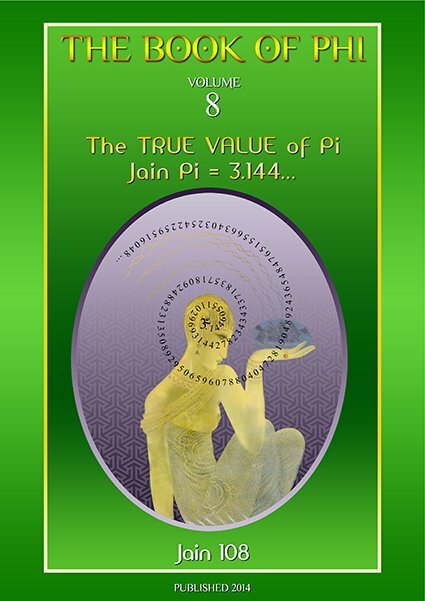 3 – True Pi is the true and eternal relationship between the Circle and its bounding Square. 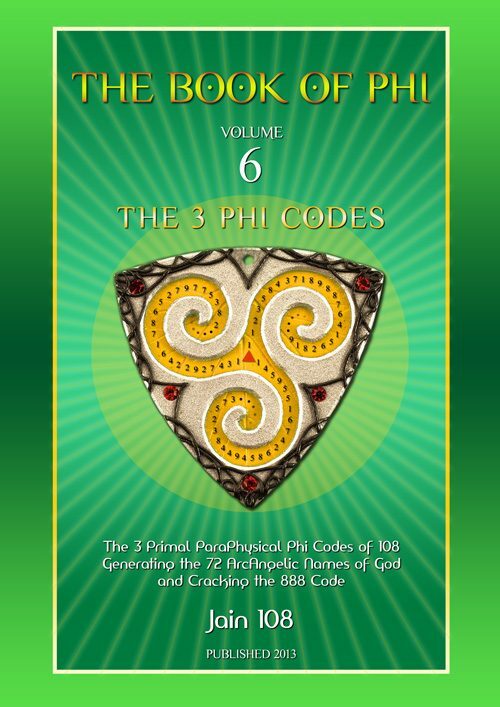 4 – To arrive at True Pi, we need to learn and understand the hidden forces, that which underpins the universe: is the concept of the Divine Trinity: here 3 tangential circles demonstrate the simple magic of Phi and root 5. 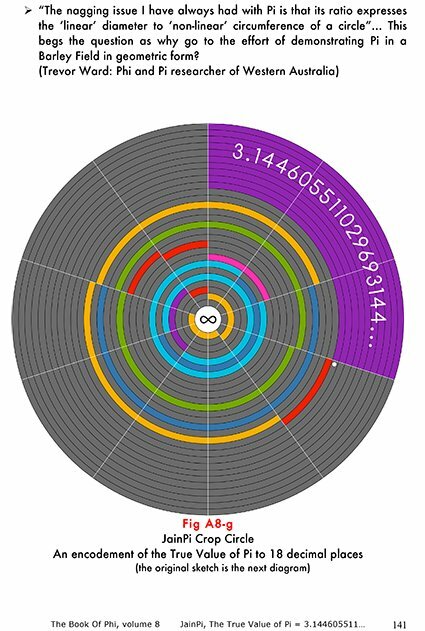 (thanks to Erik Erlandsen for this most amazing diagram). 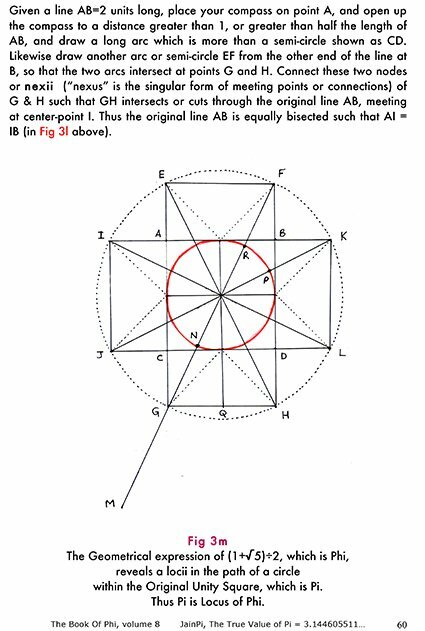 7 – Another Phi-Pi Bullet: when we geometrically express the Phi formula of (1+root5) divided by 2 we end up with its locus or locii (plural) which is the (red) circle inside the square which is really pi. 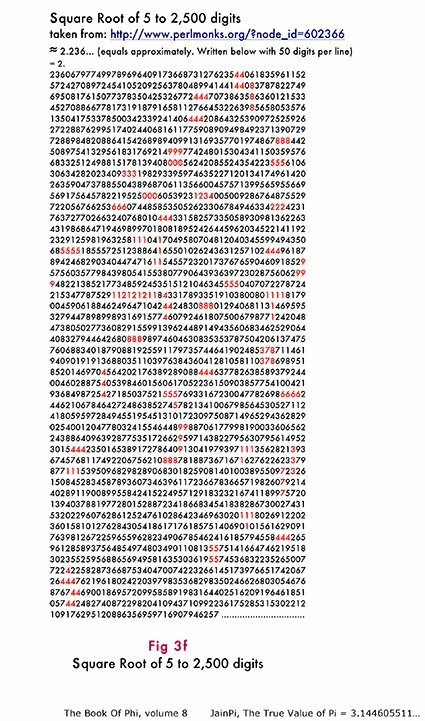 I particularly love this revelation. 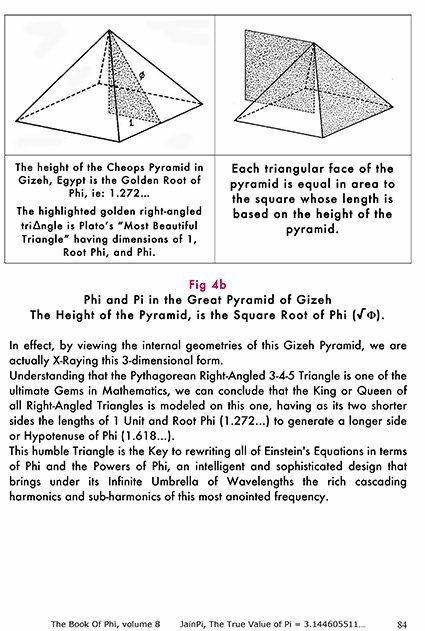 9 – Its all about the Golden Root, or the height of the Cheops Pyramid = 1.272… It so happens that the square of this height (is root Phi x root Phi = Phi or 1.618…) is the same as the square area of the triangular face of the Pyramid. 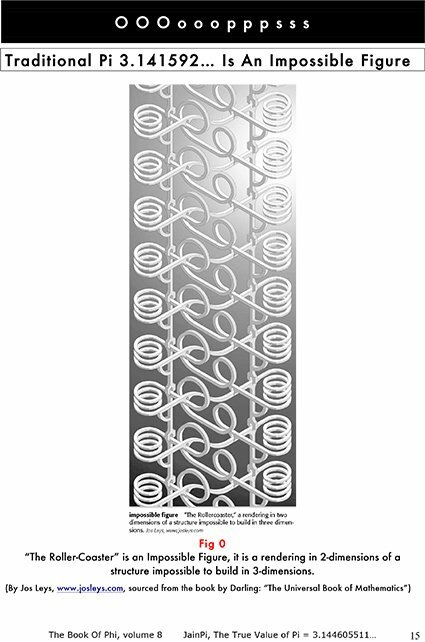 Our ancient forebears knew how to fine-tune their instruments. 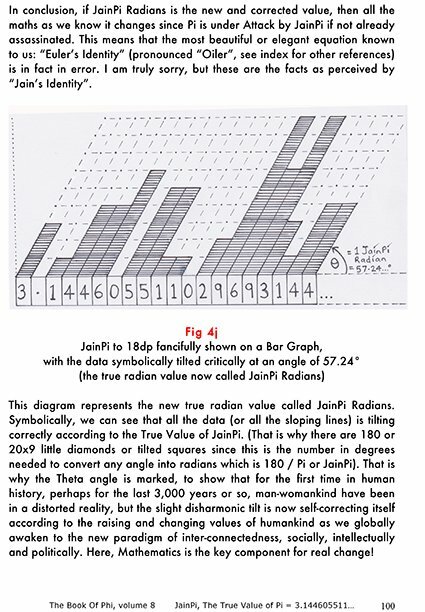 11 – JainPi Radians is the slightly corrected value of the traditional “Radian”. 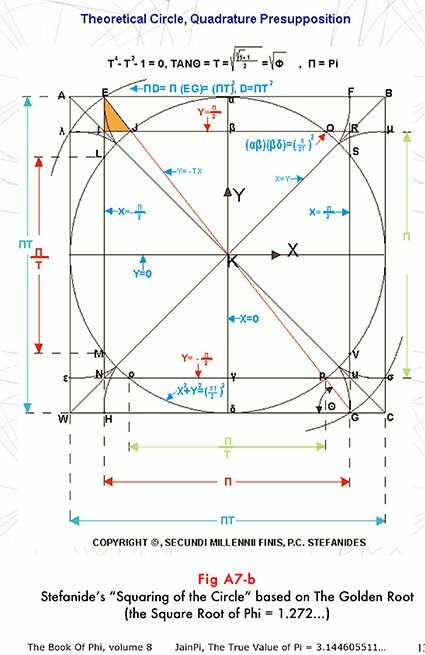 The radian is an important measure, it takes the radius of the unit circle and lays it upon the circumference, as if it was a piece of curving string, and this gives us a measurement for a critical angle of 51.24 degrees. 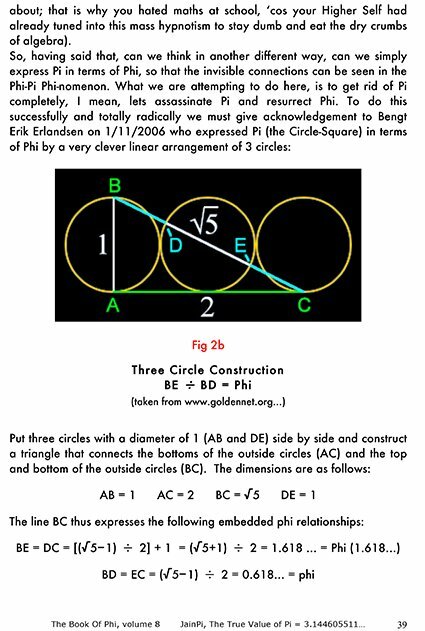 13 – JainPi Crop Circle. 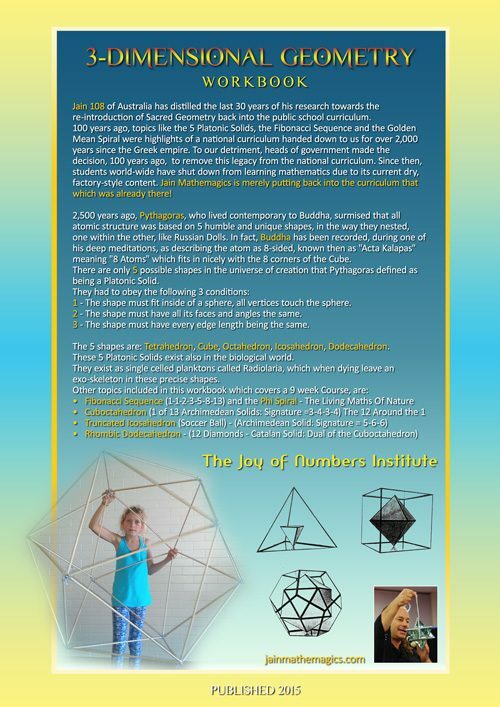 Each number of JainPi is expressed as an equivalent arc of circular measurement, moving from the outside to the inside, that is, neural implosion. 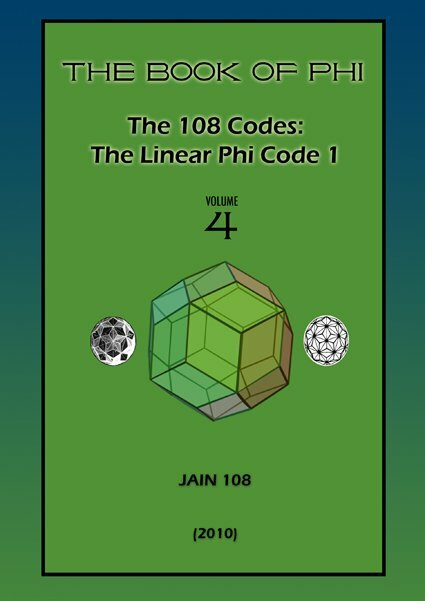 15 – JainPi to 1,000 dp. 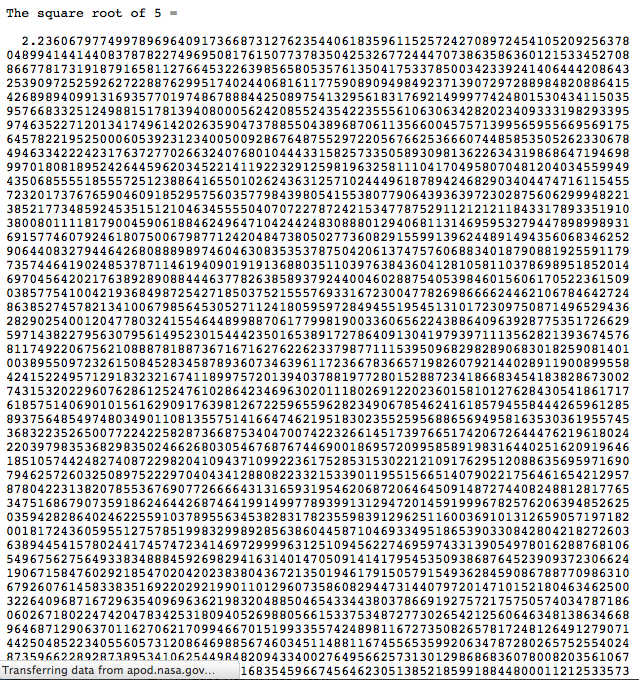 nb: the fundamental mathematics or geometry that creates this True Value of Pi is based on the Double Unit Square that allows us to compute Root 5 via its long diagonal thanks to Pythagoras’ Theorem. 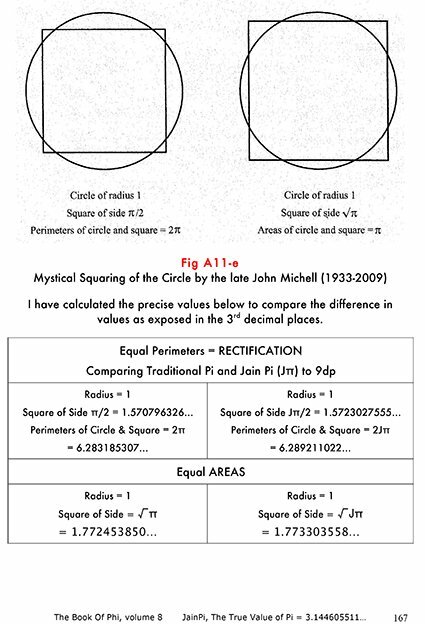 This links the Harmonics of the Square to the Harmonics of the Circle. 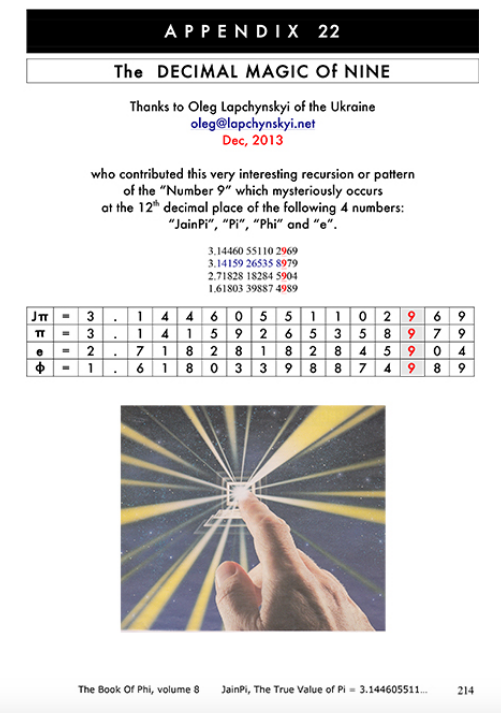 16 – 4 Anointed Numbers whose 12th decimal placement is honoured by the Royal Number 9.